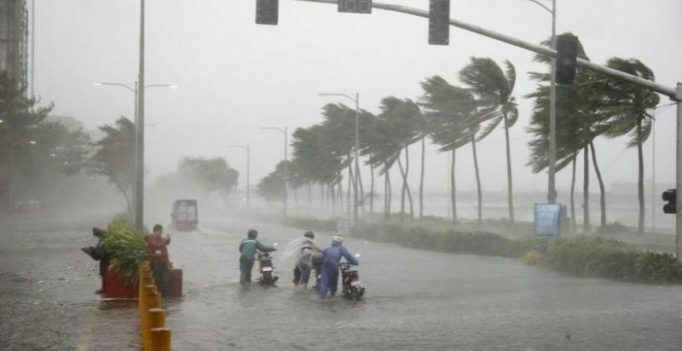 Tuguegarao: Super Typhoon Mangkhut slammed into the northern Philippines on Saturday with violent winds and torrential rains, as authorities warned millions in its path of potentially heavy destruction. The massive storm, which forecasters have called the strongest typhoon this year, blew down trees, tore off roofs and knocked out power when it made landfall on the island of Luzon in the pre-dawn darkness. As it barrelled west toward China across the disaster-prone archipelago, the storm’s gusts strengthened up to 330 kilometres (205 miles) per hour but its sustained winds had weakened to 185 km per hour. Authorities hiked the storm alert on Friday to its second-highest level in northern Luzon provinces and mobilised rescue teams. The elevated warning level carried risks of “very heavy” damage to communities hit by the typhoon and a storm surge that was forecast to hit six meters in some areas, the weather service said. “The rains will be strong and the winds are no joke… We may have a storm surge that could reach four storeys high,” Michael Conag, a spokesman for local civil defence authorities, told AFP. The storm is not forecast to directly hit Hong Kong, but forecasters say the city will be lashed by Mangkhut’s wind and rain. The Hong Kong Observatory warned that the massive typhoon will pose a “severe threat” to China’s southern coast before moving on to northern Vietnam.